Happy New Year to all! 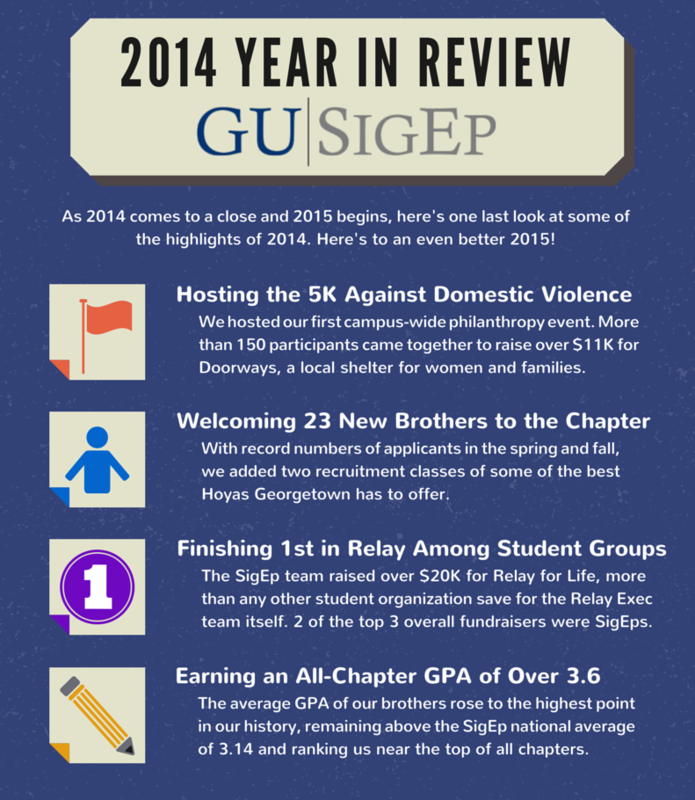 It’s been a fantastic year for the DC Gamma chapter of SigEp, and for this we are grateful. We’ve added many new brothers, watched last year’s seniors excel into a vast array of fields after graduation, and have grown as a chapter into a stronger, more potent group. This past semester seemed to fly by, yet the gains we were able to achieve were by no means abbreviated. We celebrated the year at our Christmas party and at our end of semester formal. The Christmas party was put on by our recent Sigma class and saw the reintroduction of an old tradition. With a gift exchange, a Christmas tree, and an appearance from a sad semblance of Santa, it was a great night. Our formal also was a tremendous success. At an event held at the Huxley, a venue in DuPont, brothers managed to succeed in securing dates and came together for what turned into an awesome night. Overall, it was a great way to put an end to the semester. Best wishes for all in the New Year.